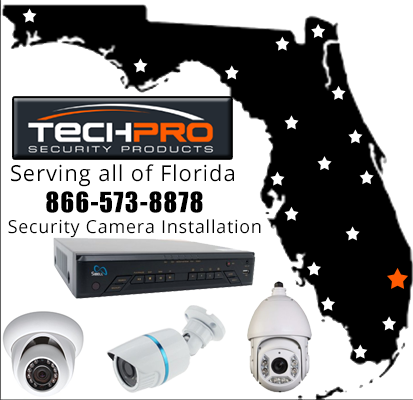 TechPro Security Products is one of the most recognized security camera installation specialist in all of Florida. TechPro can handle any size job from one security camera at your house all the way up to a thousand cameras for a public community. Our reputation for providing first class security camera installation services is renown. We use only top notch security surveillance equipment that has some of the longest warranties in the industry. A three year warranty for electronics is a rarity in the security camera trade. Our security surveillance equipment is thoroughly bench tested and put through rigorous trials. TechPro security products are chosen based on quality, longevity and a robustness that makes sure they will stand up to the elements. Common culprits such as weather and vandalism are no threat to our security surveillance products. If your business or residence is looking for security camera installation Miami give TechPro Security Products a call. TechPro Security Products is a bonded and fully insured security installation company with an Electrical Contractor License (EC13003850). We have been in business for almost 10 years and most of our security equipment is manufactured and supplied by us. In fact we were one of the first security surveillance companies in the United States to provide a mobile platform for viewing and operating your DVRs and NVRs. TechPro Security Products does not just rest on their laurels as we are continually developing innovative technology that puts us at the forefront of the the security surveillance industry. The ability to view your security footage from anywhere in the world on your smart devices permits you to have constant surveillance of your desired locale. Our pioneering remote technology allows you to completely manipulate all facets of your security system from afar. The ability to backup your important security footage remotely is crucial when an event occurs. Nothing is left in doubt when filing a police report or an insurance claim with accurate security camera surveillance footage. Our FREE TechProSS app is available in both Android and Apple stores. You can view your security footage from any smartphone, tablet, pc or mac product. Configuration of key components remotely lets you alter many different settings dependent on the environment. Push notifications for motion are a prime example of changing a setting remotely while away. If a storm passes through do you need to know every time a leaf blows thru your backyard? You can change the sensitivity to alter push notifications. TechPro Security Products is the forerunner and absolute authority when it comes to their Technical Support program. Live US based security experts will help you solve any issues related to your TechPro Security Products. Not only does this support last for the lifetime of the product but even before you make a purchase our technical support specialist will make sure that your surveillance products will be acceptable for your plan. If you do not have a plan in place we will gladly plan and layout a perfect solution for any size project. Our US based support specialist operate on both east and west coasts from 9 am to 8 pm EST (Eastern Standard Time). Our technical support agents have the ability to login into your system remotely and get your security surveillance system running quickly. Although many of our security surveillance innovations have been replicated by competitors they don’t dare copy our model and level and technical support we offer. If you forget common techniques for your security system our techs will gladly walk you through the process or login remotely to help with more advanced situations. Moving your business or residence is stressful enough let us handle your security system setup. TechPro Security Products has way over a thousand registered security dealers across the globe. Our DVR’s (Digital Video Recorders), NVR’s (Network Video Recorders), Security Surveillance Cameras & Access Control Security have been installed and entrusted by government entities, prisons, schools, daycares, communities and city buildings, police department, fire departments, streets and roads along with large corporations all over the world. Our unique FREE loaner initiative will help alleviate downtime at zero cost to you.